Above: Anthony Aguirre. Photo by N. GonzalesFor Anthony Aguirre, it began with a gyroscope. While in high school physics, Aguirre says he had a transformative experience working on calculations examining the strange effects occurring when a gyroscope spins. By describing the physical forces acting on the top-like object using mathematical expressions, he could predict unexpected and counterintuitive behavior in reality. The equations explained why, when a gyroscope began to tip over, its twirls semimagically worked to right it back up and continue spinning. Now a physics professor at UC Santa Cruz and holder of the Faggin Family Presidential Chair for the Physics of Information, Aguirre continues to address the mysteries that define our reality. His research has taken him to the earliest fractions of a second after the Big Bang and beyond, to a time before time, when countless budding multiverses might have existed. Aguirre has also turned his intellectual powers to fundamental philosophical conundrums in the present and potential existential dangers of the future, helping found two organizations to pool knowledgeable talent around these critical issues. Oh yes, and he runs a website for collective prognostication, mentors his students’ political ambitions, has written a book about objective and subjective knowledge, and continues to pursue his cosmological studies. For any other person, all this whirling activity might make them tip over. But Aguirre just keeps on going. Aguirre began his scientific career thinking big. After completing his Ph.D. at Harvard in 2000, he was drawn to cosmological studies of intergalactic gas and dust and how the universe appears on the largest scales. That led him to inflation—a theory positing that moments after the Big Bang, our universe suddenly ballooned at mind-boggling speed, becoming many orders of magnitude larger in an extremely short timespan. A contingent of cosmologists were realizing the hypothesis suggested that this early universal expansion might have never truly ended and that the part of the cosmos we see is merely a minuscule section of the whole. Countless other universes could be branching off from the larger multiverse, growing, shrinking, and collapsing all around us. Along with financially supporting such research, FQXi has hosted biennial conferences touching a range of topics including the philosophical underpinnings of quantum mechanics; the nature of scientific truth; and the anthropic principle, which states that the laws of the universe are agreeable to the emergence of life. Aguirre feels the institute has helped nudge and stimulate countless ideas and provided a place for esearchers like himself to congregate and openly declare that they, too, are interested in seeking something deeper. More recently, Aguirre has turned his attention to time, and the small sliver of existence that makes up the present. The universe has several trillion more good years ahead of it and he believes that technological decisions made in the modern day about climate change, bioengineering, nuclear war, artificial intelligence, and space travel, among others, could have severe consequences for our descendants. In 2014, he cofounded the Future of Life Institute (FLI), an organization dedicated to thinking about potential risks to humanity and how to address them, whose board of advisers has included technologists like Elon Musk and the late physicist Stephen Hawking. Such concerns are pressing yet often underaddressed in academia. For instance, some futurists have speculated about the possibility of creating super-smart artificial intelligences whose intellectual powers would exceed humanity’s. “We’d better be very careful and very sure that those intelligences act in ways that are aligned with our interests,” Aguirre says. After it was founded, the FLI hosted a meeting in Puerto Rico that brought together experts trying to identify ways to ensure that such research adhered to safety, ethics, and transparency standards. A similar conference took place two years later, when the organization developed a list of 23 principles that corporations and governments could follow to try to mitigate the negative outcomes of artificial intelligence. The principles have been endorsed by nearly 1,300 AI and robotics researchers, and, last year, the state of California adopted legislation supporting the framework, following testimony Aguirre gave before the state Assembly. His passion for such large-scale dilemmas has inspired those close to Aguirre. After many discussions with him, his graduate student Amita Kuttner (B.S. ’13, M.A. ’16, Ph.D. ’19, physics) decided that she wouldn’t be satisfied with her work unless it had impact, and has enlisted as a parliamentary candidate for the Canadian Green Party. Given her physics background, the party appointed her to their shadow cabinet as the critic for science and innovation with the special task of working on artificial intelligence, providing her with the opportunity to quickly develop policy. She hopes to eventually address things like fossil fuel regulation, universal basic income, and autonomous weaponry. Kuttner says that Aguirre was instrumental in supporting her decision to enter politics and that she still talks to him weekly. While most professors tend to steer their graduates toward academic tracks, Aguirre stands out for his ability to encourage alternative thinking about careers that can be accomplished with a physics degree. forecasters and asks them to place a percentage on the likelihood of some future event occurring. Never content to stay put, Aguirre also manages an unusual online community with his website Metaculus, which he launched in 2015 with astrophysicist Greg Laughlin, at the time a fellow UC Santa Cruz professor who has since moved to Yale University. Metaculus brings together would-be forecasters and asks them to place a percentage on the likelihood of some future event occurring. The aggregated assessments can often come pretty close to predicting realworld incidents, sort of like how the collective guesses of a large group asked to estimate the number of jelly beans in a jar tends to not be far from the true answer. 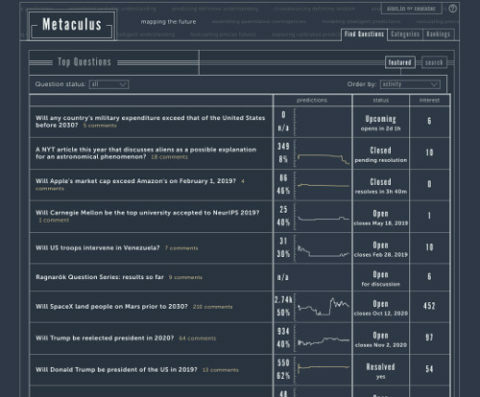 Top questions on the site include “Will SpaceX land people on Mars prior to 2030?” and “Will a restaurant serve cultured lab-grown) meat by 2021?” Metaculus has given Aguirre a new perspective on science and technology news; he says that after hearing about some innovation, he often mentally invents a Metaculus-style question and comes up with his personal probability for its success. As if this wasn’t enough, Aguirre has recently completed a book. He has long been interested in humanity’s understanding of reality, which he describes as “an interplay between the questioner and the world that’s providing the answers.” Presented as a series of Zen koans—the famous Buddhist anecdotes demonstrating the limits of logical reasoning—the book looks at connections between the objective world of fundamental physics and the subjective view of existence that we each carry inside our heads. Aguirre says working on the book helped him grapple with and express ideas that would otherwise be difficult in a scientific paper. The result, Cosmological Koans, will be out in May. Aguirre is extremely grateful that he has been given the freedom to pursue so many projects, and finds himself excited about the future, especially at UC Santa Cruz. He is eager to put time into helping with Campus Provost and Executive Vice Chancellor Marlene Tromp’s recent Strategic Academic Plan to reorganize the university into three academic priority areas—Digital Interventions, Justice in a Changing World, and Earth Futures. Aguirre says that hiring a professor for a subject like artificial intelligence ethics has previously been a challenge because it is so interdisciplinary, but he is hopeful that the university will be able to find projects that span different departments and make progress on important issues. Exactly how does Aguirre manage to keep all of his various tasks in order? “That I don’t know,” says Carroll Wainwright (M.A. ’12, Ph.D. ’13, physics), a former postdoc who works on Metaculus’s digital architecture and has recently joined Partnership on AI, a Silicon Valley consortium seeking best practices for artificial intelligence development. “He’s just extremely good at multitasking.” Whatever the case, there is no doubt that the future holds great promise and an endless supply of interesting questions to pursue for Aguirre. Yet even he knows that there are things that will remain a mystery. Asked to describe why he is oriented toward large, esoteric ideas, Aguirre finds himself at a loss. Adam Mann (SciCom ’10) is a freelance writer based in Oakland. He has written for Wired, Scientific American, Nature, and Science, among other outlets.